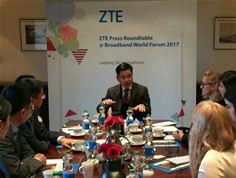 25 October 2017, Berlin, Germany – Speaking at Broadband World Forum (BBWF) 2017 today, ZTE’s Senior Vice President Mr. Xiao Ming announced the company’s future business and broadband strategy for Europe and Germany, including ideas on how to support development of the Gigabit Society in Germany. Highlighting the strong demand for targeted investments, innovative technologies and a 5G strategy for Europe, Mr. Xiao declared it was ZTE’s goal to lead the way into the Gigabit Society and to push ahead the development of a gigabit infrastructure in Germany. “In the last few months, the discussion about the digitisation of Germany has intensified and rapidly gained momentum, with leading organisations all pointing out that the need for a high-performance broadband infrastructure is indispensable for the further economic success of Germany, and that this future infrastructure must consist of a gigabit access network made of fibre,” said Mr Xiao. A major part of ZTE’s strategy is to make targeted investments in key markets in Germany and Europe. Since 2005, ZTE has been active in Germany and has established itself as a reliable partner in the German telecommunications industry. Since then, ZTE’s investments have grown steadily. In 2014 and 2015, ZTE invested over 80 million Euros, making the company one of the largest Chinese investors in NRW. As a global provider of technologies for building gigabit access networks, ZTE is investing not only in the expansion of fibre optics, but also in the expansion of 5G technology, which also requires a fibre-based infrastructure. Each year, ZTE invests 250 million Euros in the research and development of 5G. In addition to investments, another one of ZTE’s strategic objectives is to expand the broadband business in Germany to regional operators, city carriers and urban centres. The signing of a strategic partnership agreement on GPON and Gfast technologies with NetCologne, the leading provider of telecommunications technologies and services in Cologne, fits in perfectly with this strategy. As a global technology leader, ZTE will support NetCologne in Germany to enable gigabit access for up to 450,000 households in the coming months. Mr. Xiao explained that ZTE plans to use its innovative technologies in the future to build up the gigabit infrastructure in Germany. For further information, please visit www.zte.com.cn.